Dear Applicants, Are you seeking for South Central Railway Recruitment 2018? 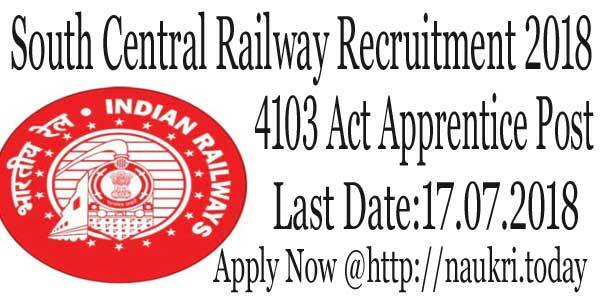 If yes we are informed you that South Central Railway has declared notification for filling up 4103 Act Apprentice Post. Applicants should check here eligibility criteria, age limit and much more about South Central Railway Vacancy 2018. Eligible Candidates must apply offline from 18.06.2018 for RRC SCR Jobs 2018. Applicants may also check Selection Process for South Central Apprentice Vacancy 2018. South Central Railway has announced 4130 Act Apprentice Post. Registration for South Central Railway Recruitment 2018 is closed on 17.07.2018. Applicants must fill up their Offline Application Form before the last date has passed. Participants should read this article completely for more information about South Central Railway Bharti 2018. Here we gave you links to download RRC SCR Notification 2018 and Application form. What are the important Dates for South Central Railway Apprentice Jobs? What is the Selection Process for South Central Railway Bharti 2018? Here we explain you horizontal trade wise and vertical Category wise classification of vacancies for RRC SCR Vacancy 2018. Participants must fill up their application form and submit it to the given address. Aspirants should apply on the Post from which they belongs for South Central Railway Apprentice Bharti 2018. You may collect here information about RRC SCR Jobs 2018 required qualification, age limit and pay band. Applicants should fill up their application form carefully otherwise their form will be rejected. Candidates may also download South Central Railway Notification 2018 to collect more details. Aspirants who are going to apply for South Central Railway Apprentice Post must qualify 10th/SSC with minimum 50 % Marks. Participants may also required ITI Degree in Trades from notified university. For furthermore details aspirants should consult to official RRC SCR Notification 2018. Here we provided you links to download South Central Railway Apprentice Jobs 2018 notification. Participants minimum age is 15 years and maximum age is 24 years as on 18.06.2018. 5 years of upper age relaxation is given to SC/ ST Category candidates for South Central Railway Bharti 2018. Participants who belong to OBC Category is relaxed by 3 years. Candidates can download their application form from links given here for South Central Railway Apprentice Recruitment 2018. Selected Candidates pay scale details is not mentioned in RRC SCR Notification 2018. Participant’s Salary should be paid on the basis of department norms for South Central Railway Recruitment 2018. For more information candidates should read official South Central Railway Apprentice Vacancy 2018 notification. Applicants will be selected on the basis of marks obtained in 10th and ITI Degree for south Central Railway Vacancy 2018. Final merit list should be created according to marks. Candidates who have more marks in 10th and ITI is selected first. To Collect more information aspirants should check official South Central Railway Apprentice Notification 2018. RRC, 1st Floor, C-Block, Rail Nilayam, Secunderabad- 500 025. Participants should pay their Application fee through cross demand draft from any national bank for South Central Railway Apprentice Recruitment 2018. Candidates need to pay Rs. 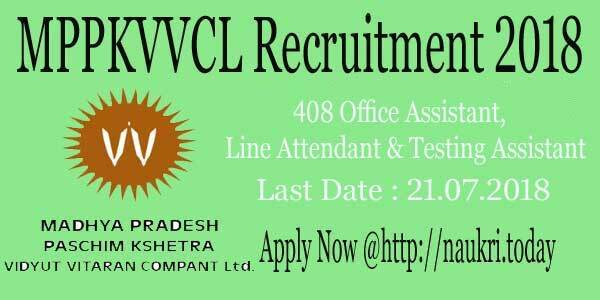 100/- as an application fee for RRC SCR Recruitment 2018. For furthermore details applicants should check South Central Railway Notification 2018. Participants should download an application form from here for South Central Railway Apprentice Vacancy 2018. Participants must fill up their application forms correctly and submit it to the given address. Candidates should follow these steps to apply for RRC SCR Bharti 2018. 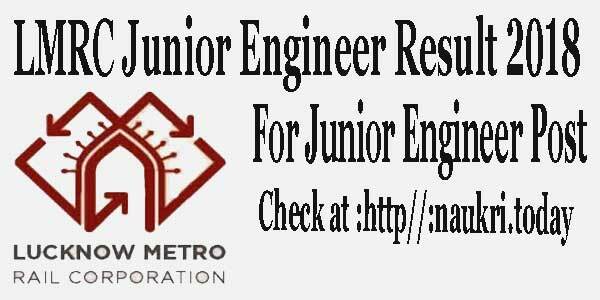 Homepage applicants should search for South Central Railway notification pdf. Click on RRC SCR Recruitment 2018 PDF & read the notification. Download application form from links given here. Fill up the required details in application Form of South central Railway Apprentice Recruitment 2018. Attach the colored passport size photo & signature in South Central Railway Apprentice Jobs application form. Recheck the application form once again and send it to given address. Conclusion: South Central Railway Department has declared 4103 Act Apprentice Post. Applicants who are interested in South Central Railway Recruitment 2018 must apply offline from 18.06.2018 to 17.07.2018. Check Here brief details about RRC SCR Bharti 2018.